Disclaimer: NuNaturals products have been provided to me for the purpose of this review by NuNaturals as free samples. This has not influenced my review and the opinions expressed in this post are my own. I am not affiliated with NuNaturals. 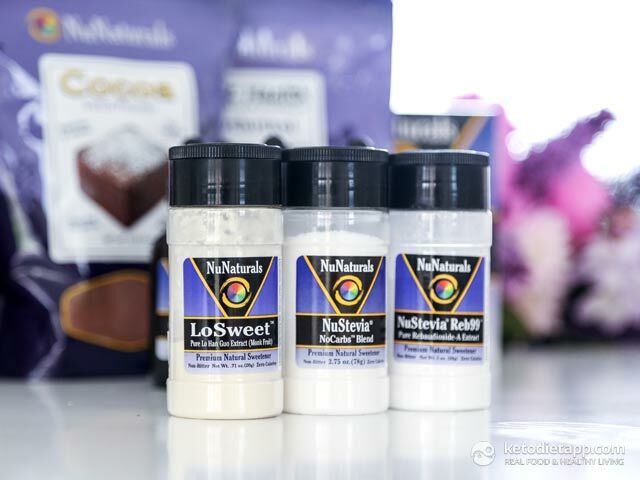 I&apos;ve been using NuNaturals for the last few months and decided to share my thoughts on some of their most popular low-carb sweeteners and ingredients I often use to make keto treats. I love their flavoured stevia drops and stevia-based sweeteners that won&apos;t make your desserts taste bitter. 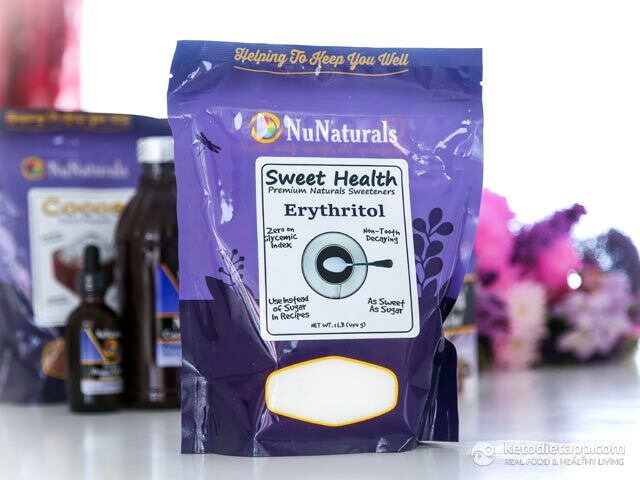 Those of you who follow my blog know that I frequently use Erythritol in my recipes. It&apos;s a fantastic alternative for diabetics and those seeking to lose body fat while enjoying the occasional keto and paleo treats. If you are new to low-carb eating, Erythritol is a natural low-carb sweetener, almost zero-carb and zero-calorie. It&apos;s not as sweet as sugar (only about 70%) but I don&apos;t mind that because I don&apos;t like my desserts too sweet. As always, you can adjust the amount to your liking. NuNaturals Erythritol tastes great and is non-GMO. Stevia, which I listed at the top of my Guide to Low-Carb Sweeteners, is another excellent natural sugar-free alternative. NuNaturals drops are some of the best I&apos;ve tasted. I mostly use the "clear" unflavoured drops but I also like the taste of vanilla drops. Depending on the flavours you like, all are great for making any keto and paleo treats. The drops do not taste bitter and the sweetness is pleasant provided you use the recommended amount, which is in most cases 2-5 drops per serving. They last for months, especially if you keep them refrigerated after opening. Ingredients in NuStevia drops: NuStevia extract (stevia Reb-A), water, vegetable glycerine and natural flavours. Clear NuStevia also contains 20% alcohol. Lo Han Supreme is made with monk fruit, aka Lo Han Guo. Monk fruit, also known as longevity fruit, is native to China and northern Thailand. It&apos;s 200-300 times sweeter than sugar and has been used in traditional Chinese medicine to treat obesity and diabetes. It&apos;s as sweet as stevia and has no bitter aftertaste. Just like Erythritol, NuStevia drops and Lo Han extract Supreme are suitable for diabetics. Ingredients in Lo Han Supreme drops: Lo Han Extract, vegetable glycerine, alcohol and water. NuStevia powdered packets are made with stevia and Erythritol. Whether you like to add a hint of sweetness in your takeaway coffee or you are planning a trip, these packets are convenient keto on the go. One packet is as sweet as 2 teaspoons of sugar and has no bitter aftertaste. NuNaturals syrups are 4 times as sweet as sugar and come in three fantastic flavours: Simple Syrup, Cocoa Syrup and Cocoa Mint Syrup. 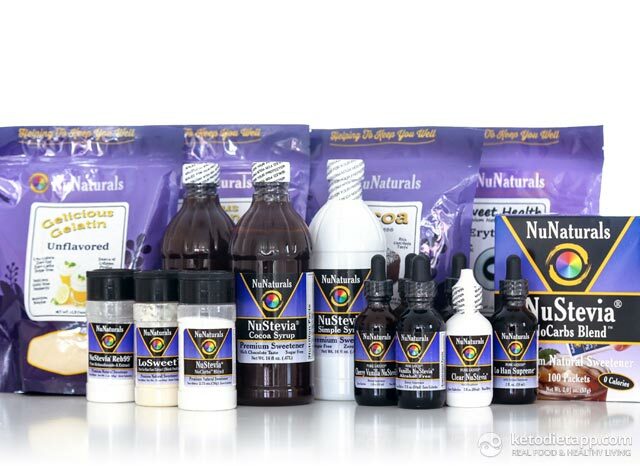 You can use NuNaturals syrups just like any other sweeteners. Ingredients in NuNaturals Syrups: glycerin, water, stevia extract (plus additionally NuNaturals Cocoa Powder and peppermint oil in the flavoured syrups). Glycerin(e) is a simple polyol (sugar alcohol) that is made either from plants or from animal fat. In culinary use, glycerin prevents crystals from forming and makes treats like ice-cream smooth and creamy. Although glycerine has a minimal effect on blood sugar, I would use it with caution and only in small amounts. It contains 4 calories per gram, as compared to Erythritol that has only 0.2 calories per gram. When using glycerin, I count at least half of the amount as carbs. NuStevia Reb99 is pure extract from the stevia plant where 99% of the Reb-A is extracted from the stevia leaves. Make sure you only use a very small amount. Pure stevia extract is 200-300 times sweeter than sugar! LoSweet is pure extract from monk fruit, as sweet as stevia and has no bitter aftertaste. NuStevia No-Carbs Blend (erythritol and stevia blend). This is the same blend used in NuNaturals packets. Are All Products with Stevia Bitter? You all must have experienced the unpleasant bitter aftertaste many stevia products have, especially if you use more than the recommended amount. NuNaturals state that all their stevia-based products are non-bitter. I was intrigued and wanted to verify that claim myself so I tasted all of them. Please, note that not everyone&apos;s palate is the same. I used the recommended amount for each of NuNaturals stevia-based sweeteners and dissolved them in water. To my surprise, even when I doubled the recommended amount, the taste was not bitter - just way too sweet. NuNaturals Gelatine and Collagen are fantastic for making healthy treats, smoothies and for adding protein to your diet. Both products come from hormone-free pasture-raised cattle. They can keep your joints, ligaments, tendons and bones healthy and reduce joint pain. They are good for your gut and help with intestinal permeability aka "leaky gut". They are great for thyroid health and help fight adrenal fatigue. There are differences when it comes to their culinary uses. Gelatine only dissolves in hot water and causes liquids to gel - remember, that&apos;s what makes your bone broth gel! Collagen dissolves in both hot and cold water and does not cause liquids to gel. I mostly use collagen in smoothies and keto coffee. Gelatine is great in keto desserts like panna cotta, creamy ice-cream, pies and even low-carb marshmallows! Sugar-free cocoa powder is low in carbs and perfect for a keto diet. Although Dutch process cocoa doesn&apos;t have the same nutritional benefits as raw cacao, it&apos;s less expensive and still offers some of the health benefits. Cocoa is perfect for keto brownies, hot cocoa (or threats like these iced cocoa coolers), cookies, chia pudding and even smoothies. 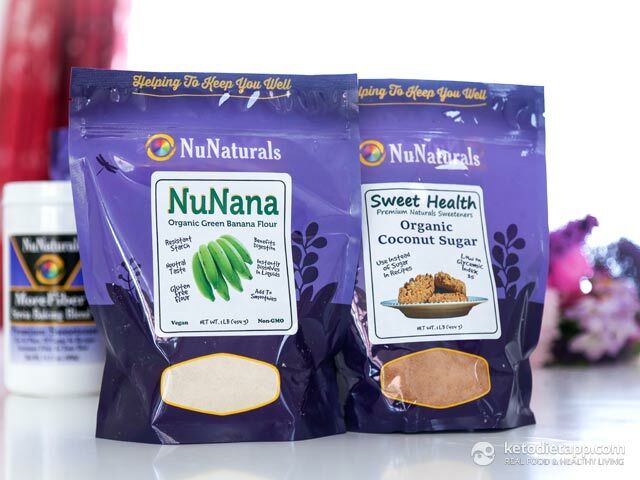 Apart from low-carb & keto products, NuNaturals also offers a variety of products for those following a paleo, but not ketogenic diet: Coconut Sugar and Organic Green Banana Flour. Note: Although green banana flour is a resistant starch (if not heated), the carb count is still too high for a keto diet. I would love to try the sweetener in the drops. I woukd love to try the packets. We keep jars of stevia packets on hand at all times. I take collagen capsules (NeoCell) and I'm so excited to see there is now NuNaturals Gelicious Collagen. It's a product of theirs I'd love to try, and of course the gelatin as well. I have used NuNaturals for years and this is the best sweetener ever! I didn't know they made gelatin and collagen, I'd love to try those. Nunaturals is hands down my favorite stevia brand. Have used the stevia for years. Interested in trying the collagen and gelatin. This looks amazing!! I would love to try the NuStevia Drops and the no carb blend 50 packets. The chocolate syrup is my favorite! 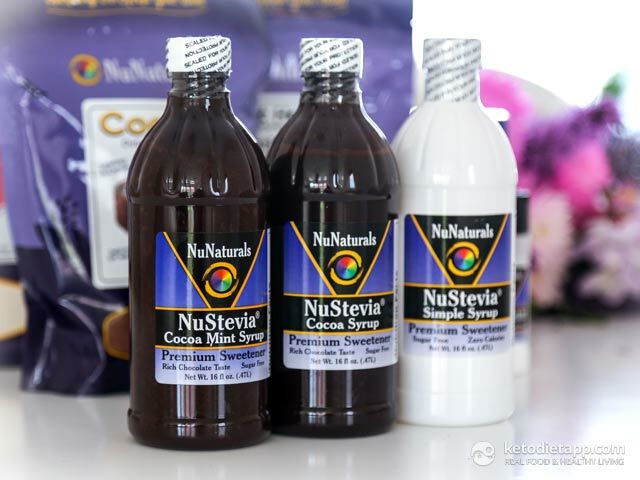 I would love to try the NuStevia chocolate syrup! I use chocolate a lot in baking or even in my coffee, so I'd love to see how this compares to other products I have tried in the past. i want to try the gelatin! I would love the Vanilla Alcohol-free NuStevia Drops. One of my favourite hot drinks was the vanilla latte by Nescafe. I can't quite replicate it in keto style, but this could be a great replacement and an awesome way to have a favourite AND stick to KETO. I've never tried gelatin before, so that sounds really interesting. Exciting opportunity! Thank you. .. The Cocoa Mint syrup intrigues me, as do the flavored stevias. What a gracious gift. Love your app. The NuNaturals look great! To pick one to try is difficult! I think the NuNaturals Syrups look like my 1st choice, followed by the Cocoa! The holidays are coming and this will be my first Keto holiday season. I want to bake and make a Keto holiday! I look forward to trying the NuNaturals Delicious Collagen. I would like to try NuNaturals Gelicious Gelatin to make some keto ice creams! Miss ice cream in general but have been resisting well and have yet to make my own ice cream at home. Thank you for a great opportunity to try healthier versions of sweeteners! Being Diabetic and pregnant, I have to watch what I eat every day. Found Keto a few months ago and I will never look back! I'd love to try the gelatin! Thanks for all the info! I am excited to check out all these products! I can see where I would use all of the low carb items... not at all interested in the banana item nor the coconut sugar. Nice choices Martina! I don't do twitter so I won't be in the drawing.  Keep up the strong work! I already use NuNaturals clear drops so I would love to try the nocarbs packets. Thanks for the giveaway! 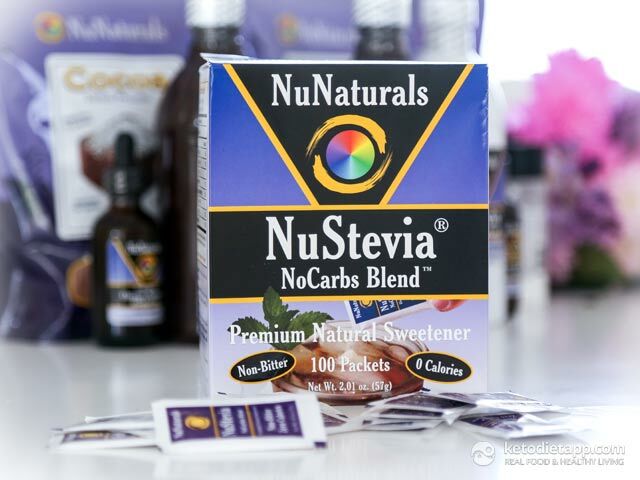 I love NuNaturals Stevia, I would really like to try their other products! I would love to win this giveaway. I have used the NuNaturals Stevia for many years and love it. I would love to try the NuNatural syrups and the collagen and gelatin. Very nice give away!!!! They all sound great, but the Cocoa Mint Syrup sounds Awesome! The stevia I have tasted has always been bitter, I would love to try this stevia in the hopes that it is different. Need to get some of the erythritol. After reviewing these products, they all sound wonderful. The first one I would like to try is the Erythritol. I have been wanting to try this in our baking to see how it compares to using honey or cane sugar. I would love to try the vanilla stevia drops. I'd wanna try the NuStevia Drops, I love putting syrup flavors in my sweets. I would love to try the cocoa! I've gotta try that collagen! I would love to try the syrups! I'd like to try gelatin and collagen. Would love to try the monk fruit. I have seen it in stores and really had no idea it was low carb until reading this post! I'm still new-ish to low carb and have a lot to learn! ☺️ Wish me luck! I would love to try them all!!!! What great alternatives to run-of-the-mill low-carb sweeteners! Being on the keto diet and having a diabetic husband, I'm always looking for new ways to sweeten desserts (plus I get to wow my friends and family who can't believe they're eating low-carb!). Also glad to know that NuNaturals uses pure stevia, not a distillate. I love this stuff! I've been using the liquid stevia in my coffee for a couple of years. NuNaturals stevia is the only stevia that doesn't have an aftertaste. I'm so excited to see that NuNaturals now has collagen! I love their sweeteners, so this is a great addition.I can't wait to try it. I'd love to try the NuStevia NoCrabrs Blend. Thanks for the giveaway opportunity. I am always looking for items to make my low carb life style easier and tastier. I've never tried any NuNaturals but I would love to, everything sounds great. I would love to try NuNaturals Cocoa Mint Syrup, my hubby loves mint so I'd like to make him a treat! Also we don't get these products readily in South Africa so it will be a real spoil! I would love to try a non bitter stevia! I want to try all of them, especially the collagen. In Nigeria where I live, this is a not a product that I can easily purchase. I'm planning to visit family in the US by the end of the year so I want to stock up on as much products as I can get. It will be great to be able to try out some things before buying them in bulk. I'm hoping to ease other family members into eating keto. I'd love to try the Lo Han, sounds great. I'd really like to try erithrytol. It sounds great. I would love to try the collagen ,great giveaway,thanks !!! Would love to try the vanilla drops! Great review and give away! I would like to try the collagen! I literally just saw on Instagram today that someone posted how beneficial collagen can be for you. Can't wait to try this! would love to try to lo han drops. interesting that it claims it has no bitter after taste so would love to try it out! I use the stevia drops, but I would love to try the collagen. I have not had the opportunity to try any of NuNatural products as they are not available in my country. To be honest, I'd like to try them all!!! To be honest I'd be interested in trying any of the products. I've only had stevia from a little packet and never anything flavoured or drops to use for baking. To be able to still make my treats and make them so they are still low carb would be great! The first product that I'd like to try is the NuNaturals Erythritol for the paleo breads I like to make. I've never had erythritol and believe it would aid in lowering my carb intake. I love bread products, which is my downfall, on eating low carb. I'd like to try all of NuNatural's products, but my second choice would be the NuStevia powdered packets or the NuStevia drops for my coffee, another one of my downfalls. I use sweet n' low, which is low in carbs, and in nutrition. It would be great to win NuNaturals products, to help with my weight lost. I've tried some NuNatural products and love them. I'm always eager to try new items in my cooking and baking. I would love to try all of these products. Never had any of them. I am most excited to try the collagen...my joints are dying for it! Interesting, I have never saw these products before . Super interested in the stevia. I would love to try the NuStevia original drops! I've heard wonderful things about them. Would love to try all the products but esp the collagen as I didn't realize all beneficial it could be! I am excited to try NuNaturals! I'd love to try the collagen! Such a great product! Would love to win this!!! OMG! I'd love to try some!!! I have Diabetes, Lyme Disease and Haemachromatosis, so would love to try the NuStevia drops and Lo Han drops. I have yet to begin Keto as I have cognitive issues from chronic Lyme and am still trying to get my head around it all. Thanks for the possible opportunity of winning this prize. The chocolate syrup is delicious! I would love to try their collagen! Their cocoa syrup is amazing! I enjoy baking keto treats and I'd love to try NuNaturals ingredients! I can't wait to try the NuNaturals gelatin in my bulletproof coffee! Up to this point I have not had the opportunity to try this brand. It looks like they have many great products that I'd like to give a whirl! I would love to try the collagen! Would love to try the collagen. I'd love to try the Cocoa Syrup! I'd love to try the stevia since it's alcohol free and the gelatin for a pumpkin pie recipe I've been working on for P3 of hCG diet. I usually recommend my clients move into keto after the protocol in order to stabilize body fat and weight. Thank you for all your amazing support! Cheers! I would love to try the gelatin/collagen. I can't wait to try the flavored stevia! Oooo.... Would LOVE to try the collagen! I would like to try the collagen. Nu Collagen please! sounds amazing. thank you! I would love to try to colleges and gelatin! I have some of the flavored stevias and use them daily! I'd like to try the lo han drops and collagen. The gelatine interests me. Thanks! Would love to find a product I could rave about. Since starting keto in January 2016 I have tried other and swerve but don't love either. The product I've used for years was stevita. Would love to find something with the right balance. The review by Martina sound like it may be perfect. I would be interested in trying the collagen, but they all look interesting. I would love to try the cocoa mint syrup. I would love to try the collagen, but haven't tried any of the products so very interested in seeing how it tastes/performs in baking. Thank you for the give away chance! I would like to try the Stevia, so many have an aftertaste, alternatives to sugar that don't have funk are hard to find. I would love to try the 100% stevia (no fillers, no nothing) and the vanilla stevia. I love vanilla. Thanks for doing this giveaway - it's a generous thing you're doing. Oh my, what a fantastic giveaway. I'd really like to try the collagen. I really like the idea of the syrups!! Sounds amazing, always wanted to try this brand! I have not heard of NuNaturals. Would love to win so I could try it. I am very interested and would like to try the gelatin first! I'm very curious about the gelatin and collagen! I'd love to try the LoSweet. I'd love to try the carb free stevia mixture. Also the collagen, and all the others actually, that are keto friendly. I live in Canada so it's harder to get some of these types of products. The syrups sound very interesting! I would live to try the coco powder. I would love to try the collagen. Such a nice variety! I love trying new products. The cocoa mint syrup sounds especially yummy. I need to be careful with sweets so I'm open to try anything that will help with help with the sweet tooth, and not effect my blood sugar. I would love to try the Vanilla alcohol-free Nustevia drops. Having something handy like that at the time of making a mug cake, or adding flavor to my coffee can come in handy. I'm currently a full time student and broke, so winning these would be a keto life saver. My wife loves making your fat bombs. I'm sure she could do wonders with these sweeteners. Would love to try all the products! I would love to try these products. I'm looking for a sweetener without an aftertaste. I'd love to try these products, especially the collagen and gelatin! Awesome thanks for the review I've been wondering about this brand!! I would love to try out the flavoured drops! I'm from Australia and we don't have a lot of variety at the moment in terms of keto approved ingredients from our supermarkets. It's also really hard for us to have access to the Amazon links because Amazon hardly ship to Australia. Would be great to try this awesome new stuff! I have not yet found a stevia that i like. I look forward to trying and making some low carb desserts that are finally tasty. I would love to try all of these products!! Would love to try the unflavored Gelatin and the Cherry Vanilla Nu Stevia. I would appreciate trying any of the NuNatural products as I am not familiar with them. I intend to take advantage of the their website offer for a discount before the end of December. 2016. I have purchases several of the stevia products and have been extremely satisfied. Everyone should try these fresh carb free alterntives to sugar. I'm excited to try baking, so the normal sweetener is probably what I'm most interested in. Since stepping onto the Keto wagon, I've learned so much about which sweeteners truly don't impact my blood sugar (I'm type 1 diabetic), and am most surprised to find that there is a sugar alcohol that actually has no or very little impact and also does not cause gastrointestinal distress. So happy to now know erythritol, and NuNaturals! I'm intrigued by a stevia with no bitter aftertaste, and the plain stevia is the product I'd most like to try. Not having a good-tasting, low-carb sweetener has been a real stumbling block for me, and I'd like to hurdle it. I would love to try the gelatin or collagen. But I'm also interested in the non-bitter stevia. Stevia always tastes bitter to me, so I'm curious about the taste of this one. I would love to try the different syrups! NuNaturals is a little bit pricy so I haven't been able to buy any products from them. Winning this would be great! I would love to win this giveaway, I've recently started a Keto diet for the last 5 weeks and I'm loving the way it's making me feel. I'm currently 29 weeks pregnant with my 11th child and by far have felt the best out of all my pregnancies since staring a Keto lifestyle. I was shown to have gestatestional diabetes and since starting the diet my blood sugars have not spiked once! 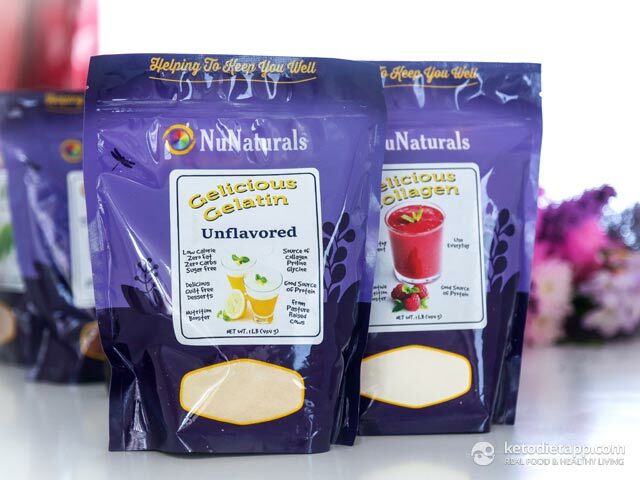 I would love to try the NuNaturals Gelatin and Collagen product!! I'd like to try the erithritol. Love to try these products!! I've been enjoying these products for year. I Would LOVE to try this amazing bundle!! Once I try it and I love it I will recommend it to everyone I know  I know I will live it especially with children as they will too. I would like to try the Delicious Collagen. Stevia would be awesome to try always looking for one that has limited after taste. Always on the search for sweeteners for my treats. Would be great to try something new. I've been wanting to try NuNaturals for a while, and your review might have pushed me to finally go and get some. I've always been wary of alternative sweeteners. Splenda and the like are so so bitter to me! Even the Stevia blend I picked up from Aldi left a disgusting chemical taste in my mouth so I really hope this is delicious! I would LOVE to try the flavored stevia drops. I prefer drops over powders unless a recipe absolutely needs the bulk, and more flavors of stevia would really help with my recipes! I currently use vanila flavor & I use I would like to try Cherry vanilla stevia & cocoa flavors. I would like you to make a Stevia flavor for spaghetti sauce. I am a keto newbe & type 2 diabetic. I would like to try them all but the drops especially so. Which NuNaturals product would you like to try most? 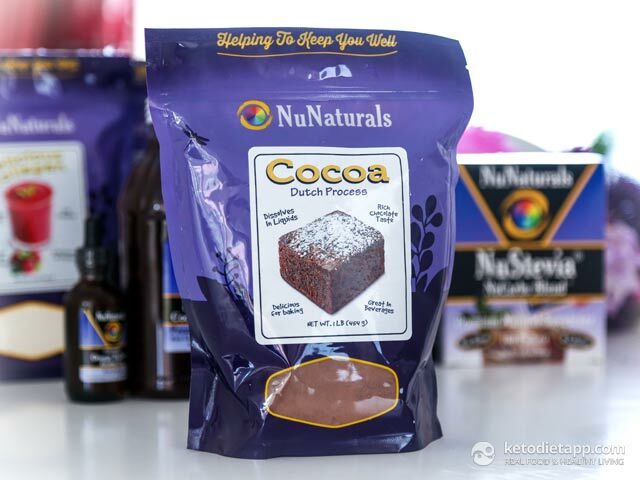 The Cocoa Syrup and Collagen I have been researching collagen and NuNaturals keeps coming up. Um, all of them??! If I had to choose, I'd go with the collagen. I would love to try these products due to me being a beginner in the keto lifestyle this will help me tremendously. Thanks for offering a chance plus were able to research it more. I'd love to try NuNaturals Gelatine/Collagen. Actually, all of them. I use the clear NuStevia every day - have for over 5 years. Love it. Ohhhhh I want to try it all!!! I would start with the collagen for sure! Excited to try these products. I'm most excited to try out the erythritol. I've tried blends before, and I wasn't a big fan. Now that I've been relatively low carb for a while now, I'm looking forward to trying a reliable brand again so that I can use it and enjoy it! I'd love to try NuNaturals. I think the product I'd like to try most is the Vanilla Alcohol-free NuStevia Drops. I would love to try the gelatin and collagen! What a fantastic "try one of everything" type giveaway. It's really hard to find products you like without spending an arm and a leg, only to be disappointed later. Thank you for the chance! I would love to try any and all of these products, they would certainly enhance my keto lifestyle. The syrups look really good as well as all the other options! I would love to try NuNaturals stevia drops and powder. Also the syrup sounds great! I would love to try the syrups! I'm always looking for ways I can make yummy things for my kids that are also safe for me to munch! These products sound great! This sounds really exciting. I'd love to try the Collagen and gelantine as I have been wanted to up that in my diet and see if it has any positive effects in general and on gut health, especially. The NuNaturals product I'd like to try the most is gelatin. I'd love to make some good for you gummys for my kids. I love the vanilla stevia! I am most excited to try the NuStevia No Carb blends! I would love to try the stevia drops - I use sweet leaf drops in my coffee daily and I love it! I would like to try the flavored stevia drops. I would love to try these! Especially the gelatine and collagen!!! NuNaturals is a great product. I would love to try the green banana flour. I LOVE LOVE LOVE NuNaturals sweeteners. I use them in my coffee, yogurt, in bagels to add flavoring, and I also use the chocolate one to make a chocolate diet coke for a treat when I'm craving ice cream. They are ALL great! first of all thank you a lot for this Giveaway. I would like to test NuStevia ! I think I'd love to try the NuNaturals cocoa syrup. I have used the alcohol free NuStevia drops for a couple of years and love them in everything except hot tea. I would love to try their Stevia drops! And I just ran out of my regular brand today, I think that's a sign! These products look phenomenal. I'm a huge fan of stevia and erythritol, would love to try these out. I would love to try the NuStevia drops. I can't wait to try the gelatin! The syrups sound wonderful! Especially the chocolate! That's what I would most like to try though all the products sound great. What a super giveaway!!! I would like to try several of these products! Love the no alcohol vanilla sweetener! I've been wanting to try the Lo Han (Monk fruit). Haven't tried their stevia products but I'm using their oat fiber and it's great for low carb baking. Will definetely try stevia in the future. Their stevia drops are my go-to sweetener. I am really interested in trying Lo Han Supreme. I am a Keto-newbie and need all of the help I can find. This would be an awesome starter pack for me. Everything looks awesome!!! Always looking for new products to try for a more successful and natural ketogenic diet.  Definitely interested in trying the sweeteners. I'm interested in trying the flavored drops and the gelatin. 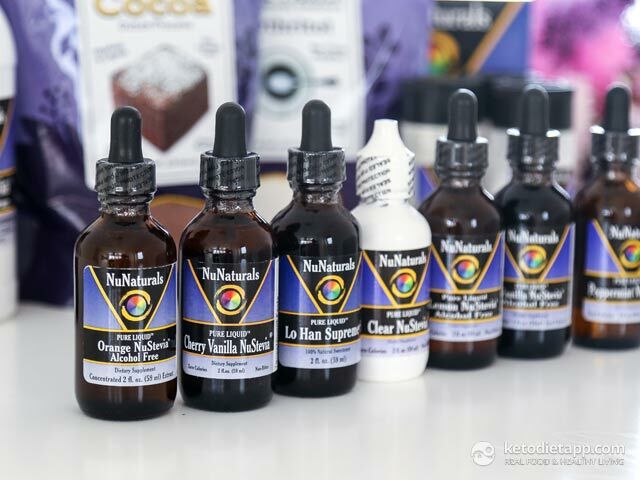 I would love to try the Lo Han drops because I've never tried that sweetener before. NuNaturals have the best products. Been using them for years. COCOA! The cravings for chocolate are insane right now and I would love to have a brownie! Can I want everything? I want it all! I would love to try the gelacious gelatin!! I failed to enter anything intelligent into your request. We use the non-alcohol Stevia syrup ALL the time. However, and this is a big one, even though I use it everywhere, I can't stand it in my coffee. Do you have anything that has less aftertaste in coffee??? I haven't tried monkfruit yet, that is definitely on my to-do list. Thanks for the rundown. Which NuNaturals product would you like to try most? I would be excited to win any of these products. I've only tried the drops though. Awesome! I had given up on stevia long ago because it always tasted bitter to me. I would love to test out the NuNaturals to see how they taste!! Maybe there is hope for stevia and me yet! I want to try them all but the No-carbs Blend & the Vanilla NuStevia Drops sound very versitle & useful. That is fantastic, can't wait for the results. I really hope these can be shipped to New Zealand! They look good. I would love to try the syrups. I have never used them and it sounds interesting! Thanks! Wow! I had no idea NuNaturals had added so many products! That's great! Oh, I would love to try them all. But if I have to pick, I would say the no-carb blend as I am still having problems with swerve making my baked items taste cold and weird! Can't wait to try the vanilla stevia! I am really really interested in the NuNaturals Cocoa Syrup! Ooh! The gelatin & collagen sound awesome! Oops, I should have added that I would love to try out the Clear Drops and the NoCarb packets. I would love to try the cocoa syrup. I think it would be great for cooking! I have to also say that I'm finishing up The Keto Summit that ran all this week and very motivated to stick with the diet/lifestyle so your blog will help me I'm sure. Have you watched Dr. Seyfried's and Dr. Fung's talks? Those were exceptional!